We are not alone anymore! Thanks to Kris, we had the flexibility to actually chose a place to eat breakfast, rather than find the nearest gas station. We drove (!!) to the Blueberry Cafe where the owner Alexandra greeted us enthusiastically and invited us to share a special kind of sweet bread displayed at the front. The bread was shaped like a Christmas wreath with candied quince and red cherry on top that we originally mistook for peppers and other savory toppings. It had been sliced into small pieces AND it was entirely complimentary. 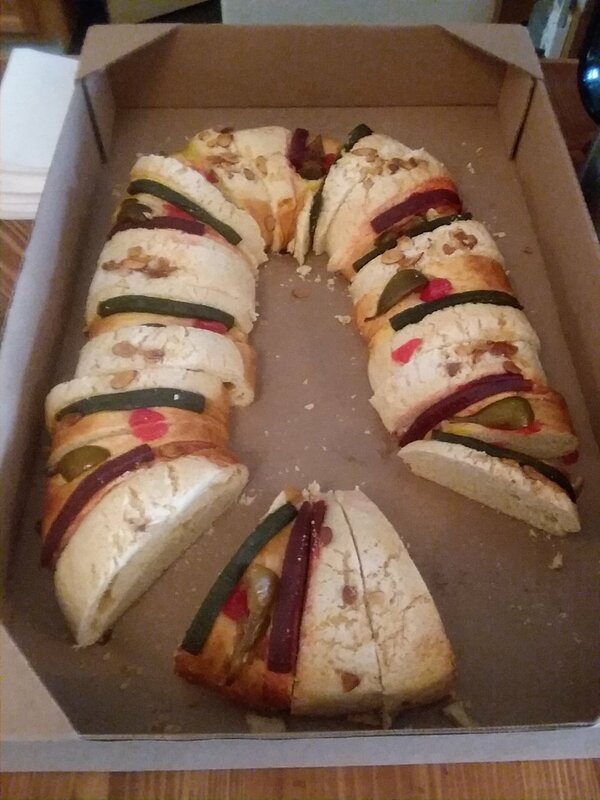 It’s a custom in Mexico to serve this on Three Kings Day (January 6). The baker hides a baby Jesus in the batter and whoever finds it has to throw a tamale party on the Day of the Candles (February 2). Alexandra encouraged us to take some but warned us we’d have to invite her to our tamale party if baby Jesus was in our slice! We’d be happy to, she was one of the friendliest people we’ve met on this trip and her cafe is worth a visit if you’re ever in the area. After eating and more talking (our little trio of Claire, Kris and Tenny gets along GREAT) we drove to a spot on the border that made sense mileage wise from where we’d end the day. It was Kris’s first view of the wall and we got to see it anew from his eyes. In this section it’s comprised of a double mesh screen reinforced by metal poles every ten feet. The hollow poles are strengthened with batches of cement poured down their insides, leaving a crust of hardened overflow spilling from the top. We gathered that cement served as a cheaper material than solid metal. 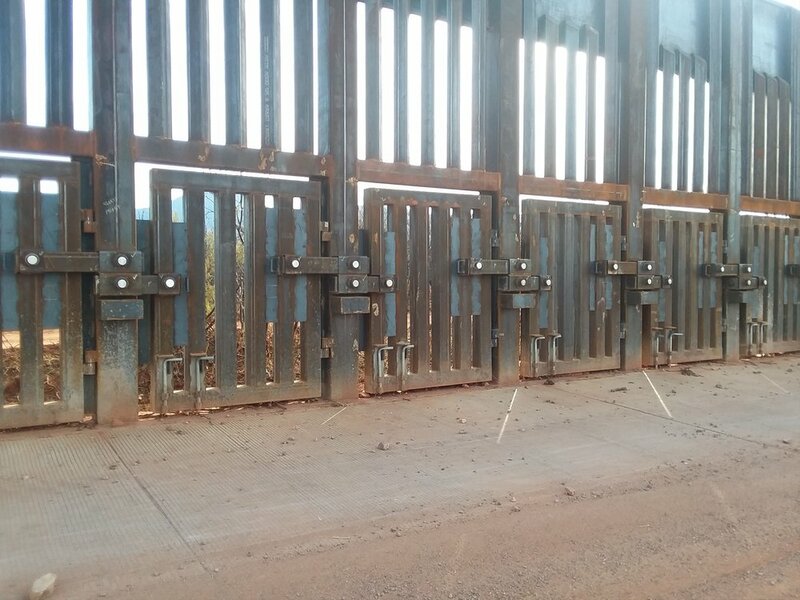 The wall was short here, maybe ten feet tall which feels wimpy compared to what we’ve seen so far. Still, it’s an imposing gash across the land and it’s uncomfortable to be this close. We reluctantly parted from Kris, planning to meet up later and tasking him with figuring out where to sleep that night. We walked all morning long in the shadow cast by the wall. A little ways in it transitioned back into the familiar model with thick, vertical columns. The sun flickered through the bars and across our faces creating a dizzying optical illusion. 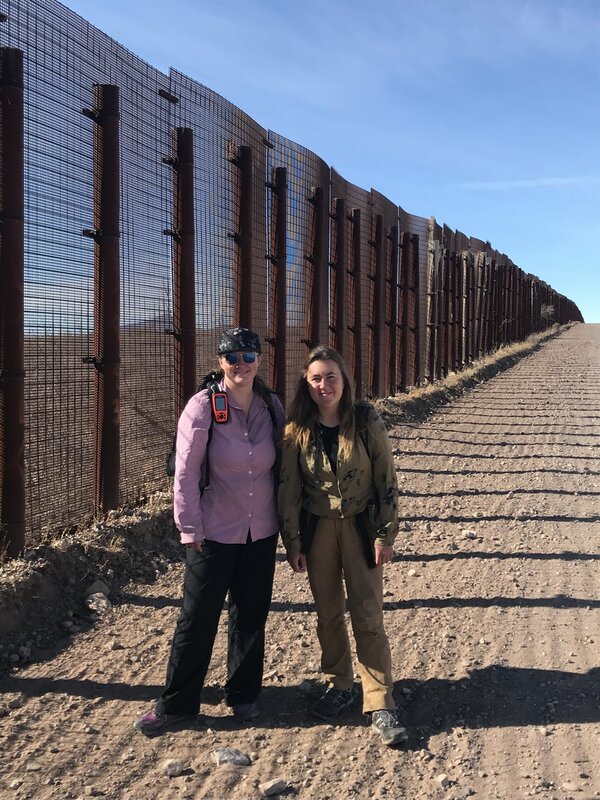 On the Mexico side of the wall we could see the old fencing, a barbed wire running parallel to its much taller cousin. So many forms of wall here. Are any better than the last? By early afternoon, we’d reached a split in the road with a “US Property: No Trespassing” sign blocking our path. The sign prompted a good 10 minutes of debate over what to do. Shouldn’t we be able to access federal property, especially on foot? On the other hand, we DO NOT want to have to turn around and rewalk miles. Better safe than sorry, we opted for the safer and only slightly longer public-access road. The road started out quiet but got busier as we departed the fence line and moved closer to the outskirts of town. Houses, trailers and RVs were packed in small clusters scattered along the road’s edge. None of them had their own yard or space, they were crammed on top of each other. Either one family owned five buildings or five families lived in extremely close proximity. Each cluster of buildings had a sign indicating the proximity of a water pipeline. Perhaps the water access dictates where a house is built? Water delivery is too costly to run to each individual house? One house had a junkyard of odds and ends scattered about, a chain-length fence, several yapping dogs and one jarring addition: a huge sign that read Carlos Ramirez Murdered Two Years Ago. As we neared Naco, we passed through several green crop fields that stood out against the drab desert background. The road brought us steadily back towards the fence and we reached the port of entry. This must be a sleepy spot to cross the border, there were only a couple cars waiting in line and the much bigger port at Douglas is less than 30 miles away. The entire town of Naco could fit within one square mile and consists almost entirely of small residential homes. 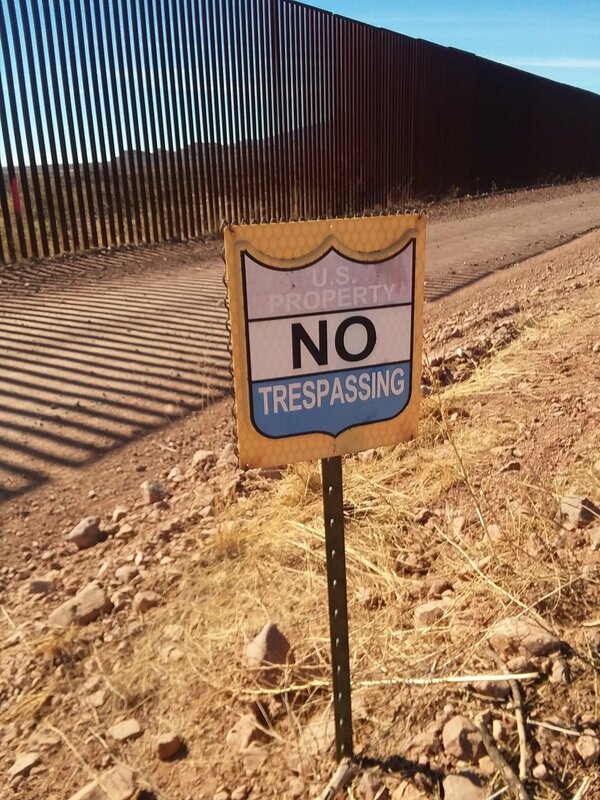 We were so involved in conversation that we failed to notice another “US property: No Trespassing” sign as we left town and rejoined our border wall road from before. GoogleMaps had routed us along this road and we didn’t even think to question the directions. 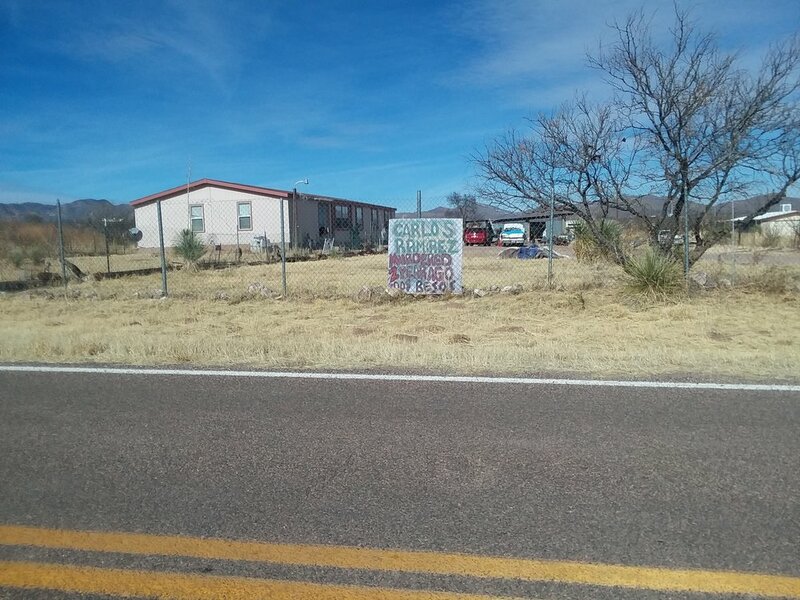 Apparently Google does not have infinite wisdom and authority because a short distance in a Border Patrol agent stopped and informed us that we couldn’t be out here. He started the conversation aggressively, prepared for a fight, but became progressively friendlier and more apologetic as the conversation wore on (and as we questioned him why this area in particular was off limits when we hadn’t had this issue before). He used the standard phrase “it’s a safety liability” to explain why and told us that the order to reroute us had come from his boss. Seems like we’ve heard that one before? We tried to ask about specific boundaries but he didn’t seem to have the tightest grasp on the geography of the area or where property lines began and ended. As we were turning around to go back to Naco, he suggested we call John Ladd, a nearby landowner, and see if we could get permission to cross his lands. He even gave us his number! We made it back to Naco and called our favorite support-person Kris for a pick up. He showed up with cold water and treats and we headed back towards town. We waffled a bit on calling John, scared as we are of ranchers and their (stereotyped) protectiveness of their land. This will be a major challenge on this trip, and we are going to have to figure out a system for asking for permission. Tenny bravely took one for the team and dialed the number the BP agent had given us. John was skeptical at first but he had a friendly and curious nature and soon enough he was chatting away, offering a ton of information on the history of his land which had been in his family since 1897. He also shared some stories about living on the border and told us that he saw border activity (people crossing his property?) almost daily. And best case scenario - he granted us permission to cross his lands! Thank you John! Tenny thanked him gratefully, hung up, and tried to relay the entire conversation to Claire anxiously waiting nearby. It feels good to have some confidence about our route tomorrow.